Gentle yoga is for everyone. If you are brand new to yoga, here is a good place to start! This class will introduce you to the basic foundational poses and techniques of yoga. You will learn a basic group of warm-ups, asanas (physical poses), basic breath awareness and deep relaxation. You’ll be taught safe alignment and proper breathing in each pose so that you can experience the benefits of yoga from the very first class. You’ll learn how to modify any of the poses to make them accessible to your individual needs. It is an effective approach to developing flexibility and strength and encourages deep relaxation. Gentle yoga also offers a transformation for those with physical limitations: chronically tight muscles reduced range of motion in joints weakness, low muscle tone recovery from surgery or injury inflammation, and heart conditions. Foundations level 1 introduces the fundamental hatha yoga poses. The perfect class for beginners and continuing students. This alignment based yoga method will help you feel your best, and enjoy the benefits of increased flexibility. Yoga basics level 1 is a perfectly balanced class. Accessible for everyone. Focusing on proper alignment. You will increase your strength and flexibility. Learn to find your balance on the mat and off the mat. Everyone is welcome! This class is ideal for anyone who has ever hesitated to try yoga because of the challenge of getting down on the floor or doing standing poses. Use of the chairs makes the poses safe and accessible to anyone regardless of their particular needs. In Chair Yoga just about any pose can be adapted to sitting on a chair. You will learn many yoga postures, alignment, breathing techniques, and meditation. Suitable for students of any age, this class is not limited by age, weight, arthritis, or other physical limitations. This is an excellent class to increase mobility, create strength, develop balance, inspire tranquility, and an overall sense of well-being. 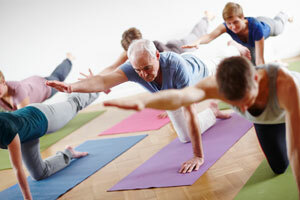 BLY hatha yoga class is a blend of yoga asanas (poses). Hatha yoga balances the mind and body through asanas. Asanas teach poise, balance and strength, and are practiced to improve the body’s physical health and clear the mind in preparation for meditation. 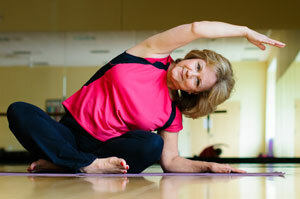 The stretches of yoga induce a sense of relaxation thought the mind and body. The signs of success in hatha yoga are slenderness of the body, cheerful face, bright eyes, and enjoying its therapeutic effects. Notice these effects from the first time you step onto your mat. For beginners: We recommend starting with Gentle, Gentle Flow or Restorative classes. What to expect at your first class with Better Living Yoga (BLY). Always take your shoes off before entering the studio. Cubby holes are provided for your shoes and other belongings. At the start of class, Better Living Yoga (BLY) teachers often like to ask their students of any injuries, illness, or conditions they have, so they can propose any necessary modifications for that student or students. Many teachers will start their class with an invocation. Some teachers will not. Either way, make yourself comfortable. Many Teachers will end their class in a cross-legged easy pose, putting their palms together in front of the heart and inviting students to do the same. Your teacher might say, “Namaste”, which roughly translates to, “I bow to the God within you”, or “The Spirit within me salutes the Spirit in you“ a knowing that we are all made from the same One Divine Consciousness. Please arrive several minutes early so you have time to set up. Setting up consists of laying out a yoga mat and sitting on your mat in a comfortable cross legged position. You may want to sit on a folded blanket. If you happen to be a few minutes late, don’t worry. Simply be considerate and wait quietly by the front desk for a moment. Then enter after the invocation. This way you can join the class without disrupting the other students. Wear comfortable work out type attire. A tee shirt and soft, elastic waist shorts or leggings work well. Consider comfort and stretchy. Layering pieces such as long-sleeved thermal hoodies and lightweight zip-up jackets. These are ideal to wear during cooler weather when traveling to a yoga class. Layers can also aid in raising core temperature and loosening muscles during the warm up and prevent chills during final relaxation when the body is not producing as much heat. Clothes that are very baggy are not recommended as it makes it more difficult for the teacher to see your alignment and extra fabric can get in the way. Please avoid all perfumes and scented lotions. In general, the best way to practice yoga is in your bare feet. Being barefoot helps to encourage proper posture and stability. If, for some reason, you cannot practice yoga barefoot, wear yoga socks, which are thin with a gripping sole. Practicing on a sticky mat can also give you better traction and balance. Plan on leaving your shoes and socks at the door. Better Living Yoga has all the equipment you will need for your practice. You are welcome to bring your yoga mat if you’d like, but we have mats available for your use. Come with an empty stomach (don’t eat for at least 1½ hours before class). Try not to eat before class. Last but least, have fun! Don’t forget to breathe. BLY isn’t a competition, its a graceful way of living.